Kreischberg, Austria – Austria’s Anna Gasser and Mons Roisland of Norway each claimed victory at this season’s first slopestyle World Cup competition staged on the 2015 world championships slope at Kreischberg on Saturday. Gasser, the 25-year-old local favorite, lived up to expectations in dominant fashion by keeping the momentum from a second-rank finish at last weekend’s Moscow big air World Cup. She topped the women’s competition with the highest score of 81.25 earned in her third run, which was actually a victory lap after none of the other girls had been able to bump her from the top spot. Gasser, who earned silver at the worlds two years ago, landed a boardslide to frontside 360, backside 720 mute, frontside 360 indy, 50-50 frontside 180 indy out and a huge cab 540 underflip mute to bring home her career’s fourth win, her first in a slopestyle event. Switzerland’s Sina Candrian (69.25) and two-time X Games champion Silje Norendal of Norway (62.90) finished second and third, respectively. Two weeks before turning 20 years old, Roisland secured his career’s first win in his fourth World Cup start with 84.25 by nailing his third and final run, which consisted of a cab lib to fakie, cab 720 tail bonk, switch backside 1260 melon, frontside 1440 indy, frontside 270 out and a backside double cork 1080 nose to finish things off. The Norwegian, who had to take the semi finals detour to qualify for the finals of the best ten men, edged out 2015 world champion Ryan Stassel of the USA (83.30). Up-and-coming 16-year-old talent Redmond Gerard (USA; 81.35) rounded out the podium in third. 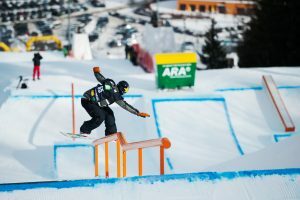 The snowboard freestyle World Cup tour continues next week with this season’s second slopestyle and halfpipe event staged at the LAAX OPEN from January 16 to 21.